BURNABY – The Burnaby Task Force On Homelessness has developed from an informal group to become The Society To End Homelessness In Burnaby. “I am pleased to publicly announce the creation of The Society To End Homelessness In Burnaby. The Society has been established by the multi-stakeholder Task Force to build sustainability, to provide leadership in the reduction and ultimately, resolution of homelessness in Burnaby,” states Society President Karen O’Shannacery. 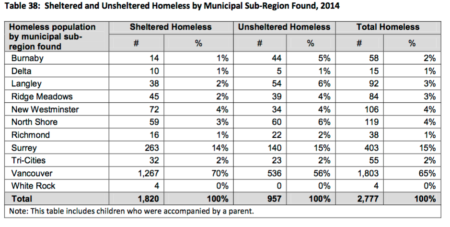 Burnaby has few resources and no emergency shelter despite being the home community to an underestimated (58 converted to annual) homeless individuals and the 5th largest population of unsheltered homeless in Metro Vancouver. Homelessness is life threatening health hazard; homeless people die between the ages of 40 and 49, and 48% die by accidental means. In Burnaby, 34 residents have died since 2006 as a result of the long term effects of homelessness and extreme poverty. The Society To End Homelessness In Burnaby seeks to change this. “The Society To End Homelessness in Burnaby is non-partisan and works with all to assist homeless Burnaby citizens. We believe that it is only with collaboration between the three levels of government and the regional health authority that every Burnaby citizen will receive the services and housing they need,” states Wanda Mulholland Community Development Coordinator. The Burnaby Task Force On Homelessness was founded in 2005 bringing together Burnaby service and housing providers aiding local homeless, government, police, the health authority, businesses and Burnaby residents to collaboratively respond to and plan for the needs of individuals, families, youth and seniors who find themselves homeless in Burnaby. The establishment of the Society To End Homelessness in Burnaby formalizes this successful cooperative approach to addressing local needs, and furthers to goal to reduce and ultimately eliminate homelessness in Burnaby.